Description: This selection of platters is completely customizable!! This pattern shown is available in 25 different colors, 25 different accent colors and 25 different font colors. The combinations are endless! These platters make the perfect gift for weddings, showers, housewarming, holiday, Mother's Day or a birthday. Use a monogram or first names or a last name to personalize. They are sure to be a hit!. Colors for design, accent color and fonts are: Jungle, raspberry, navy, cornflower, cherry, midnight, teal, sunflower, kelly, mocha, petal, lime, chocolate, tangerine, pine, slate, cranberry, butter, lilac, melon, gray, turquoise or bubblegum. Melamine is the latest trend in personalized products! Thought to be only for children, these designs have been freshened and updated to include some wonderful adult versions which look great on any table, either used as outdoor-ware (around the pool or lake) or inside to mix and match with your tableware and spice it up with some fun colors and designs! 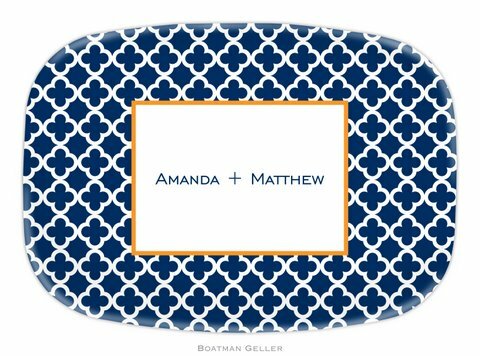 Our personalized Melamine platters are made in the USA. We hope you are as excited about this new product offering as we are! All of these make great ideas and we’re confident that you will have fun making selections! Please note that the colors of the finished plates for Melamine are slightly more muted than you see on the samples here. Platters are dishwasher safe, but not recommended for the microwave.